Season the steaks with a BBQ spice rub or cracked 4 pepper mix and a little salt. Allow the meat to come to room temperature. Never cook meat straight from the fridge as it will take longer for heat to get to the middle. 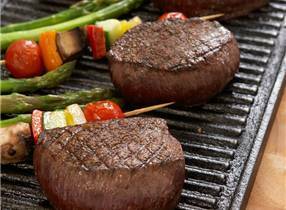 Heat an oiled BBQ plate or grill pan to a high heat and cook the steaks 3 minutes each side for medium-rare. Do not poke it or flip it incessantly! Test for ‘doneness’ by pressing the steak to test for resistance. It should be soft, about as soft as the heal of your thumb when your hand is in a loose fist. Never cook venison past medium rare or it will develop some strong metallic flavours due to its low fat and high iron content. For thicker steaks, sear them on the hotplate and then finish in a 150 ̊C oven for a further 5 minutes for a more evenly cooked steak as the grill will tend to dry the meat if thick pieces are left on the grill. Once it is done remove the steak from the heat and rest for a further 5 minutes to allow the meat to relax and the juices to distribute evenly. Thread summer vegetables onto a skewer and brush with oil. Cook alongside the meat to pick up the meat flavours. Serve with a spicy BBQ sauce fruit relish.